Not at 10 volts. The resistance of human skin is high enough that you won’t even feel it at that voltage. Have you ever heard of someone getting electrocuted by a 12v car battery? Those are capable of producing hundreds of amperes but good luck even noticing a tingle if you grab both terminals with your hands. That being said, this is a really cool hack. If this were extended to all six strings and controlled with a microcontroller, one could potentially do some very interesting things with this idea. If your hands are sufficiently wet (think: sweaty) especially with some salt (think: sweat), even a voltage as low as 10V could induce impressive current. If a person is actively playing the guitar with significant grip on the strings and strumming with the other side of his body, there’s going to be a nasty and potentially heart jarring jolt. You are misinformed. It won’t be dangerous, no matter how much salt and water you add to those 10V. FYI, when I was a kid, I use to test 9V batteries using my tongue. “I use to test 9V batteries using my tongue.” Those are DC. This is AC. “Safety first.” Is there some particular reason that Testicules must use his salty, wet hands to grab a conductor charged 10 watts AC??? If not, why bother guinea pigging yourself? DC is worse than AC – whereas with AC the voltage (and thus current) go to 0 several times a second, no such luck with DC. I think your only chance of electrocution is if you play your guitar intravenously. Warning: Don’t touch this setup if you are barefoot and are profusely bleeding from your hands and feet. Yup. Well done, HaD: you have come one step closer to BIG DISCLAIMERS of POTENTIALLY LETHAL CURRENT with your Arduino-powered arc reactor replica if you manage to trip while wearing it and jam the pins into your chest cavity. There’s enough wild speculation, speculative fear-mongering, and misinformation on even these boards without editorial additions. This is a cool hack; way to sully the presentation with your knee-jerk reaction to a Big* Scary Number of Magical Mystery AC volts/amps. * big relative to the handful of milliamps and volts you are used to seeing. Which, incidentally, are also enough yo kill you if injected directly across your heart across electrodes placed in your chest cavity. Much like the hack above. >if you were to inadvertantly touch the string and ground it to earth, there is enough current in the circuit to kill you. Unlikely. Most of the current would go in the least resistance path which happens to be the strings. The strings are conductors, so you would at most get a few voltage across the entire length. Unless you have open wounds, you are unlikely get killed with that. Might want to read up on your basic resistor circuit first? Maybe 6 of them if they’re permanently mounted. The problem with EBow is the company behind it. They go to such great length to protect their “secret” that they fill the things with a tough epoxy to deter reverse engineering. Have seen cases where they have sued people trying to make their own. It’s a bloody mess. Was looking into how those worked awhile back to build my own even though I kind of understood the concept already, by time I had spent a couple days reading up about others that did the same and the legal trouble they ran into as a result. Well I haven’t even bothered since I know my big mouth would brag about it. You could never make a self strumming guitar this way. The reason being that each open string has a fundamental frequency. As he demonstrated with his sweeps, the string will only ever resonate in a meaningful way at its fundamental frequency. In order to make the strings vibrate to a melody (beyond something that can be done with 6 notes on an open tuning), you will have to depress the string onto the frets. Moog actually released a guitar that does a very similar thing but uses the magnets in the pickups themselves to drive the strings. Fancy DSP would look for the loudest frequencies, amplify them, and then send them back out as magnetic field changes. The end result is that you could have an infinitely sustained guitar, or if you played with phase, selective string dampening (only one string can ring), and a palm mute effect (all strings dampened). The “strumming” sound at resonance comes from the string colliding with something–probably the magnet. Definitely a cool proof of concept, but there’s not much to do in this direction without adding something more to the system. So, Hackaday, making up stuff in the titles now, are we? I was hoping to see the guitar actually play a song. Oh come on, you can’t deny it has a Hendrix vibe to it. Granted, it doesn’t play the star spangled banner and then set light to itself, but it’s a work in progress. Don’t get me wrong, I like the project. But when I read “Ghost Guitar Plays Hendrix” I expect something resembling a guitar playing something resembling a Hendrix song. Or a hookline. Or any recognizable song. Or more than one tone. This isn’t Buzzfeed, you don’t need to trick me into clicking by promising things that aren’t delivered. VERY cool work. it would make a great physics demo, too. Look up Chorachello, it was one of the turn of the century ways of getting louder purer sound before electronics changed the scene. Cut and pasted from earlier HaD article. There was a correct pitch generated AC voltage sent to EACH note in a piano and large “sub-panels” for bass. I started a Google search once on the e-bow. I read of chisel explorations and many successful builds, never any legal warnings or C&D’s. Did they tell Hendrix not to stand too close to his amp stack as this would violate their “patent”? C&D’s to Eddie Kramer? They never deserved a patent in ’65 (long expired) as Tesla was first with the earthquake machine. Feedback! Armstrong, 1912. They deserve a little credit for tacking (e-) onto a noun inventing many of our modern things. The post office tired this thing called e-mail in the early ’70’s. They would scan your letter, transmit it to the distant PO and print it and mail it locally. Same day! I will continue to play in the street at next Mosey Down Main Street. It’s self contained. From lithium battery thru FX to amp and hotspot type monitor. It does not use a magnetic pickup only the putdown is. I sometimes call it Pink Floyd in a can. And electric guitar that will KILL YOU! THAT’S ROCK AND ROLL! But really the mechanism behind this, vibrating the strings with AC and magnets seems like it would be far better suited to a piano. Also, is it AC or just PWM? Mosfets are unipolar, right? …My circuits professor would probably throttle me for not knowing. but he said he’s using a ‘mofset’. That’s gotta be different than a plain old mosfet, right? yeah, mofset, it’s a Metal Oxide Field Semiconductor Effect Transistor. Don’t ask me how it works, but I plan on patenting it. Ah yes, I believe Field Semiconductors are what’s used to make FPGA’s. Yes, that’s what I heard too. lol. Yeah he did, there’s no such thing as a MOFSET right ? MOSFET yes. So basically, he made a speaker. Not really, because speaker can produce varying tones. 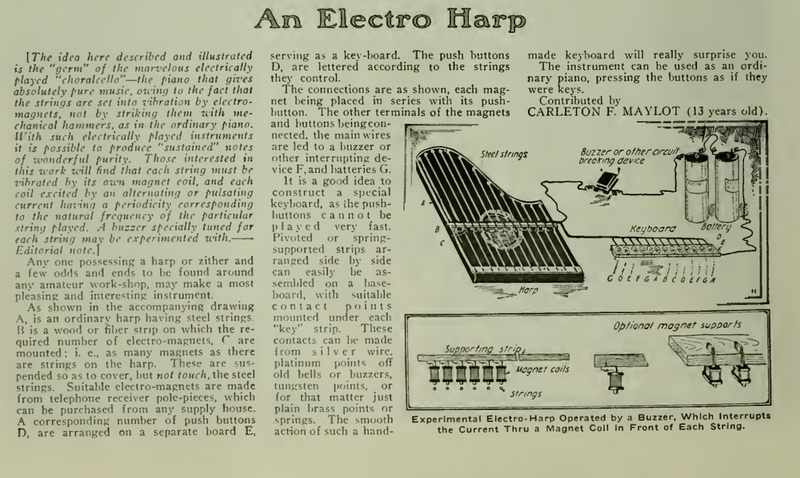 This is essentially an electric tuning fork (assuming the guitar string is in tune in the first place). This is a great demonstration of the right hand rule; the kind that would get people interested in science even if it has not real useful application. I like it. Smart idea.